He discovered the bodies of the American missionaries murdered in the jungles of Ecuador by a then headhunting tribe. 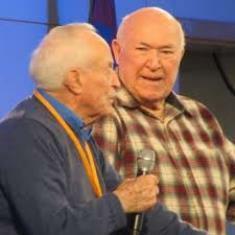 HARRISONVILLE, MO (ANS – January 26, 2018) — Veteran American missionary, Frank Drown, who passed away on Monday, January 22, at the age of 95, made worldwide history back in January 1956, when he found the body of his Missionary Aviation Fellowship (MAF) pilot friend Nate Saint. The couple had agreed to talk about the terrible yet life-changing events that took place on January 8, 1956, when Jim Eliot, Pete Fleming, Ed McCully, Nate Saint and Roger Youderian ventured into the eastern rainforests of Ecuador, where they made contact with the Waodani, people, also known as the Aucas. With a homicide rate of 60 percent, the tribe’s behavior placed them on the verge of self-annihilation. The missionaries’ story was made famous in the pages of Life Magazine, but during the extraordinary interview, the Drowns were able to give more insight into what occurred all those years ago. Marie then entered the conversation. “All of the missionaries that were killed were our good friends,” she said. “Marj Saint [Nate’s wife] was also a good friend of ours. Before we ever met her, she sent in with Nate, a tray of ice cubes, and we hadn’t had ice cubes for years. We made lemonade, and it tasted like something we’d never known before. It was so different with ice cubes in it. Now Ross and Kathy, the daughter of Nate Saint, are husband and wife. Frank said that he had given Nate a radio to go into the jungle, but as the missionaries wanted to keep their mission a secret, they spoke in code. “They didn’t want other people to know, so that if it did happen that we got to be good friends with those Indians, that there wouldn’t be a whole rush of all the people wanting to go in there,” he said. “So, I knew that and they told me what he was going to do and I loaned them my radio so they could take it along, and I knew where they were, I knew what frequency they were going to talk back to me because it was my radio. And so I listened to them, and one day only, on Friday when they had a good contact with the Indians and they called back and said it was great. ‘The neighbors came,’ one of them said. Drown said that as he was on the network of radios, so they could all talk to each other, and on the Monday morning he received an urgent message from Marj Saint. He went on, “Marj went right straight to me and said, ‘We haven’t heard from the men since yesterday. They were supposed to talk at 4:00 and they didn’t answer. We’ve lost contact with them.’ And she wanted to know if I would be willing to go and form a rescue party and go down into that jungle down there and see if I could help them. “It was terrible especially as I heard that another MAF pilot had flown over there and he could see the little airplane down on the beach where they’d landed, but he couldn’t see anybody around, and I knew this was bad. He explained that the US Air Force had dispatched a helicopter to the area and they could see straight down into the water of the river where the plane was, and they said they saw some bodies. Frank said that Roger Youderian had built an airstrip in the jungle at the request of an Indian leader who wanted to hear more about Jesus. “I went back again and one day he said to me, ‘I want to be the bow to knee one.’ That meant he wanted to get down on his knees and ask Jesus into his life,” he said. He said that only one body — that of Ed McCully — was not found at that time. “We didn’t find Ed, but the Indians found him weeks later, and they said they buried him, but I don’t know whether they did or not,” he said. “The other four were buried on the beach. “After I had gone and buried the men and came back home, we had three days of rain and I was there at Ed McCully’s house because he lived the closest to these Waodani, and I had time to think this whole thing through. Why did this tragedy happen? “God could have stopped this anytime along the way. It’s understandable that if we just had a big shower there wouldn’t have been a sand beach for them to land on. And if one of them had stayed up in the tree house and could have shot and scared them off, and that might have changed things. And when they first landed, the tire was ripped, and the tube was showing. But anyway, those things didn’t happen, and God allowed those men to go and to die and you say well that is wrong. “Folks, a private never tells the general where you’re gonna fight. And so we are God’s people, and where God puts us, that’s where we work. And God will take care of us until He’s ready to move us out of this world, and so that’s the way it is. And God did that. He wanted those men to die so that He could talk to our people here in America that you need to give your life to God and sacrifice. We don’t want sacrifice. We don’t want pain. We don’t want anything like that. Frank and Marie Drown, who have told their story in a book called Mission To The Headhunter were speakers at the Calvary Chapel Mission’s Conference at their conference center in Murrieta, California, when I interviewed them. They also spoke on a Saturday morning after the conference at a packed missions meeting at Calvary Chapel of Costa Mesa. Also speaking were Steve Saint, the son of Nate Saint, and Mincaye, who, as a young warrior was one of the tribesmen who killed Saint’s father, Nate, and the four other young missionaries, and is now a believer and has been reconciled with Steve and the Saint family. The entire story was movingly told in the movie, End Of The Spear, in which the filmmakers explored the story from the tribe’s perspective — and the remarkable way God changed the tribe’s violent way. Frank Drown was born Sept. 30, 1922 in Curlew, IA to Jay R. and Mary (Cross) Drown. He earned his Bachelor of Divinity at Northwestern Bible in Minneapolis, MN where he also met his wife. 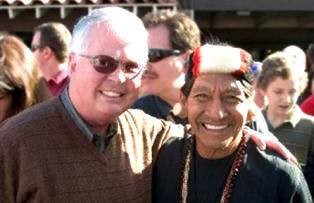 Together they served as missionaries in Ecuador for thirty-seven years for Avant Ministries. After returning to the United States, he owned Frank’s Tree Farm north of Smithville, MO. Frank loved meeting people, telling stories and trips to Canada fishing for Walleye and Pike. He was a member of Open Bible Church in Belton, MO and loved to sing hymns. Frank was preceded in death by daughter Irene Derksen, brother Blaine Drown, twin sisters Ruth Brallier and Ruby Jackson, brother Robert Drown, sisters Grace Porter and Elizabeth Asp. 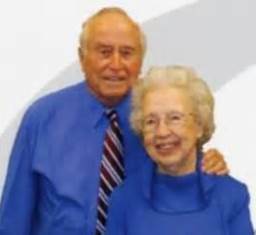 He is survived by his wife of seventy-three years Marie Drown, of the home; daughter Linda Root, Raymore, MO; son Ross Drown and wife Kathy, Asheville, NC; son Tim Drown and wife Ahping, Jakarta, Indonesia; daughter Laura Erdel and husband Dave, Santo Domingo, Ecuador, S.A. and nineteen grandchildren. You can see a moving video about Frank’s life at https://www.youtube.com/watch?v=BxUXfskOIcw&feature=youtu.be, and will be played at his memorial service at 2:00 PM tomorrow (Saturday, January 27th) at Avant Ministries, 10000 N. Oak Trafficway, Kansas City, MO 64155. Interment is at Greenlawn Cemetery, Kansas City, and visitation will be 6-8 pm, today (Friday) at Speaks Suburban Chapel, 18020 E. 39th St., Independence, MO 64055. I am sure that Frank has already met up again with his five missionary friends who were killed in Ecuador. I’d love to have been in on that heavenly conversation. Wouldn’t you? 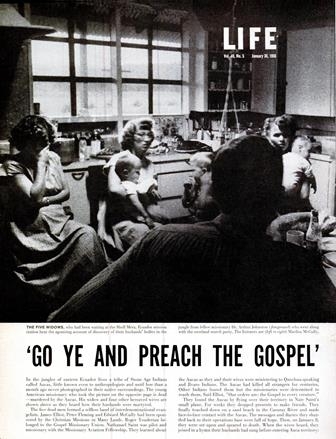 Note: Some 54 years ago, my wife, Norma, accepted the Lord into her life, on the very night when we showed a film strip at my father’s church in Birmingham, England, about the five missionaries. So that was day we will never forget. 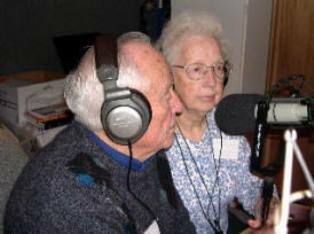 Photo captions: 1) Frank and Marie Drown pictured during their interview. 2) Nate Saint with one of the tribe members. 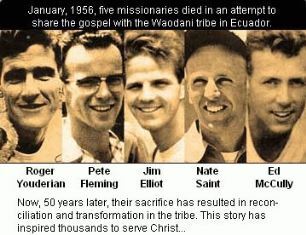 3) The five missionaries. 4) Frank speaking at Calvary Chapel Costa Mesa, as Pastor Chuck Smith looks on. 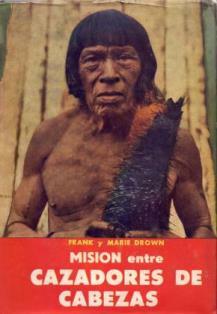 5) One of Frank’s books in Spanish. 6) A recent picture of Frank and Marie Drown. 7) Dan Wooding with Mincaye at Calvary Chapel Costa Mesa. He was on of the tribe who admitted he had been part of the murder, and has since accepted Christ. 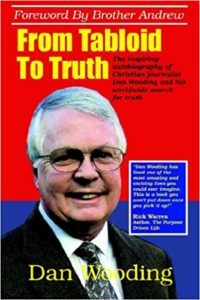 About the writer: Dan Wooding, 77, is an award-winning author, broadcaster and journalist who was born in Nigeria of British missionary parents, Alfred and Anne Wooding, and is now living in Southern California with his wife Norma, to whom he has been married for nearly 55 years. They have two sons, Andrew and Peter, and six grandchildren who all live in the UK. Dan has written numerous books, the most recent of which is Mary, My Story from Bethlehem to Calvary (http://marythebook.com/), a novel about the life of Jesus through the eyes of his beloved mother. ** You may republish this or any of our ANS stories with attribution to the ASSIST News Service (www.assistnews.net). Please also tell your friends and colleagues that they can have a free subscription to our news service by going to the above website and signing up there.